Our cruise ship, the Louis Cristal, arrived in Athens early this morning. After breakfast we disembarked and met our local tour operator and guide. Andi has guided my groups several times over the years, and I am pleased to have her with us. She divides her time each year between the USA and Greece. We drove by the usual historical places in Athens, and stopped at the old Olympic stadium before going to the Acropolis. Syntagma (Constitution) Square was clean and orderly; not at all the way it has been portrayed on American TV lately. I am not saying that the things shown on TV never happened, but that when the same video clips are shown over and over for many days it leaves the wrong impression. I had hoped that the scaffolding and cranes used in the restoration of the Parthenon would be gone. Such was not the case. The only place I could get a photo without showing these things was from the back. The back of the Parthenon in May, 2012. Photo by Ferrell Jenkins. 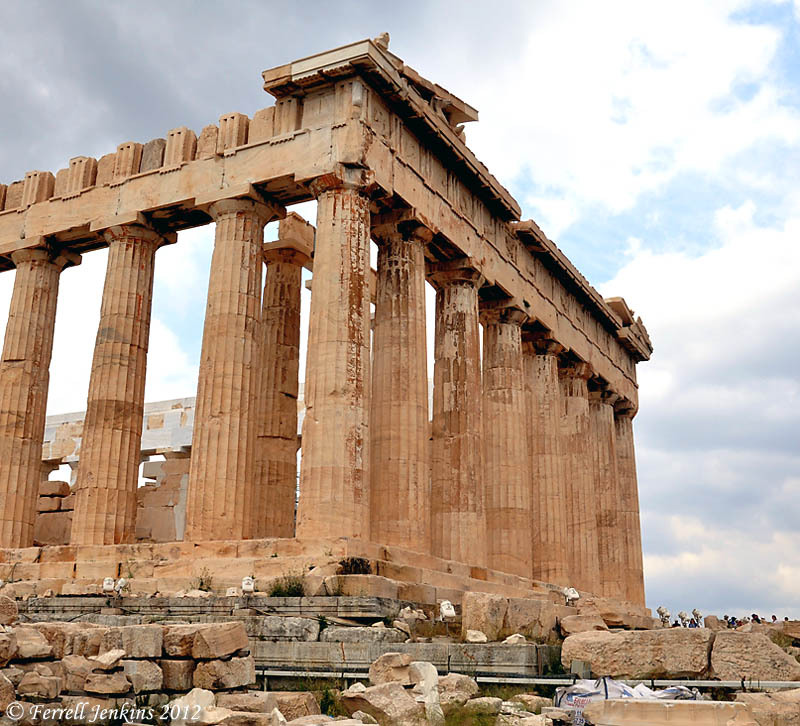 The Parthenon, where the virgin goddess Athena was worshiped, was built between 447 and 438 B.C. It is still quite a building. We also visited the Areopagos (Mar’s Hill), possibly the place where Paul delivered his speech on the Unknown God (Acts 17). While the group went with the guide looking at some highlights in the Athens National Museum, I made some photos of the nice collection of Roman Emperors. The head is crowned with the corona civica (a wreath of oak leaves and acorns) tied with a ribbon. 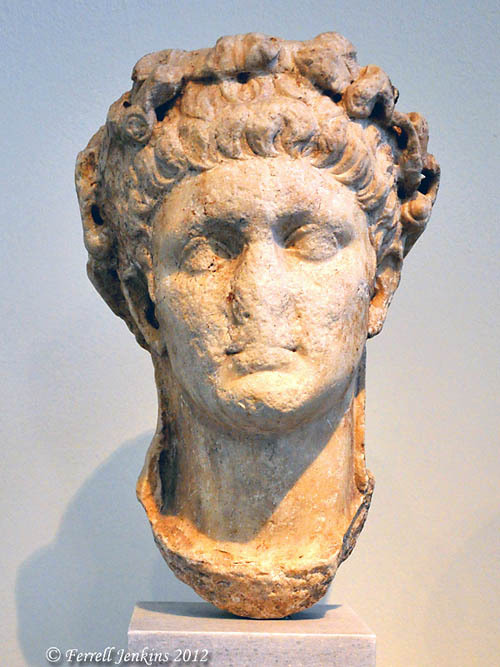 The Roman Emperor Claudius in the Athens National Museum. Photo by Ferrell Jenkins. Paul’s visit to Athens and Corinth was during the reign of Claudius. In fact, the emperor is mentioned in Acts 18:2. The great famine mentioned in Acts 11:28 also took place during the reign of Claudius. We have plans to visit Corinth tomorrow. This entry was posted in Bible Places, Bible Study, Culture, Greece, New Testament, Photography, Travel and tagged Parthenon, Roman Emperor. Bookmark the permalink. We’re going to Athens in August. Looking forward to seeing these sites. Any chance, we could get the contact info on your tour guide? (You can private message me on facebook) Thanks!